"Polkaroo is an established and trusted trademarked TVOkids mascot that is appreciated across generations." "While we can understand the nostalgia, TVO does not endorse this parody of Polkaroo ... or the fact that it is being associated with an activity that is neither legal for children nor recommended for use by children. We are asking Mark Scott to take appropriate action to stop the use of this character." Scott claims that his character's appearance is purely coincidental, and that both characters are similar only in that they want to teach young minds to grow. Polkaroo teaches young children by using psychedelic journeys of the imagination, while Tokaroo teaches young adolescents about marijuana and its legal, responsible consumption. 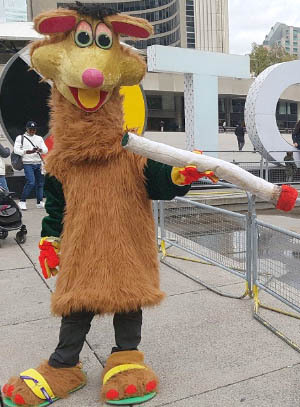 The self-taught mascot maker added that when he dresses up as the weed-smoking Tokaroo, parents stop him on the street to pose for photos with their children. He does his best to keep the joint out of the frame. Excluding a battle in court, Scott dreams of eventually adding more characters. TVO's Polkaroo is a "Candoroo" - a fictional species that combines the words "Canada" and "kangaroo". Scott wants the Candoroo universe to expand and embody "many shapes, sizes and colours," turning the character into an "infinite symbol of representation." "The idea is to go with the childlike attraction we have with everything," he said. "To get past an issue, we have to talk about it, and evolve into an 'it's OK' position. You know, it's OK to be you." 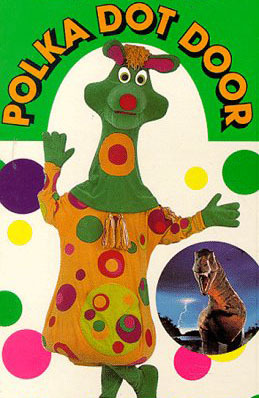 That Polkaroo kinda looks familiar... Maybe it even made it onto some South African TV channels for a bit. This whole story reminded me of a parody series I saw in university - Spongebong Hemppants. The "It's ok to be you" thing reminds me of the 1970s production Free to Be... You and Me. 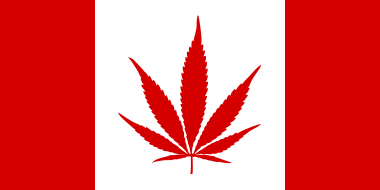 And having grown up in Ontario in the early 80s, I think this is hilarious! I was never into the Polka Dot Door - even when I was six years old, it felt boring because it was aimed at really young children. Still, TVOntario produced a couple of shows (on different budgets) that were probably a subconscious influence on me towards the fandom. There was Cucumber ("Children's Underground Club of United Moose and Beaver for Enthusiastic Reporters") and, with a less creepy but still dorky kangaroo outfit, Math Patrol. Then they'd import stuff like Jeremy the bear (aka Colargol or Barnaby), Fables of the Green Forest, and Doctor Snuggles (now there's a cartoon to watch under Canada's new law). In other news, psy act The Boards of Canada sued for being "too trippy for school."